Pulse width is like Heart of Micro controllers applications. We need them for like everywhere. From Driving the motors to dimming the lights. 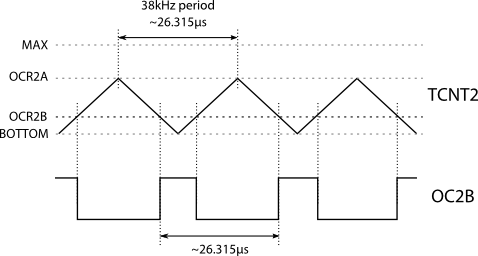 Check out our other blog posts to see how we have used PWM (Pulse Width Modulation) in our applications. As we know our controllers as being digital buddies can understand and produce only 1s and 0s (+Vcc and Gnd). And say now we need 2.5V and we aren’t that rich to afford DAC’s.So PWM it is. Now as we need 2.5V what it will do is at high speed it will switch between 0Volts and 5Volts so it will produce an equivalent pseudo analog voltage of same duty cycle of PWM. In our micro controllers it takes help from Internal timer and with respect to it, it generates the PWM. We won’t be going deep in this stuff. Just we are gonna show you how to generate PWM in our very favorite AVR micro controllers. TCCR1A will decide what kind of waveform we want and TCCR1B will initiate it. 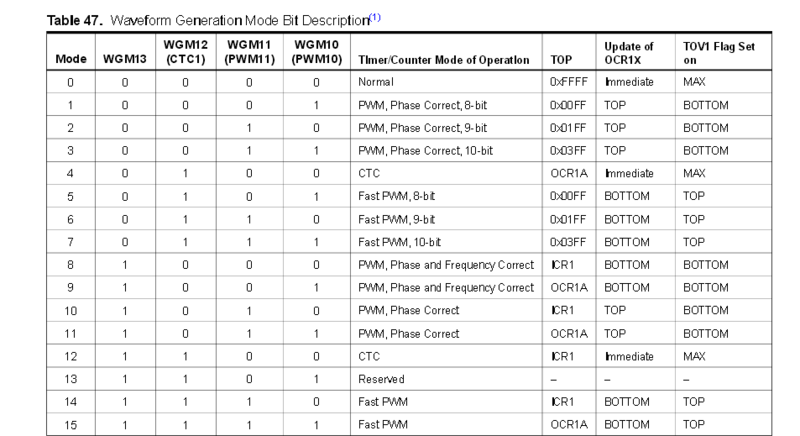 They both have WGM (Waveform Generation MOde) register which will decide the type of PWM. There are four bits and 16 choices. We like Phase and Frequency correct with ICR as top so we choose that. Then here is COMxAx and COMxBx bits which will decide the OCR switching types. Choose any it wont really matter. except putting all 0’s it will disable PWM. and the TCCR1B as we have seen in regular timers enable it and its configured. Now you need to decide the frequency and Duty cycle. there is this formula, use it to calculate value of ICRx and put the value in it. refer our other codes for more operation details. And yes you can shift the frequency and Duty cycle , Enable and disable it in real time using code so its really great deal. Do the variations with different modes like Different timers, Fast PWM, different compare modes etc. Check it yourself. If you have got any doubts, Post in comments. That’s all for today. Stay tuned for more stuff. 0,0 – This PWM channel is switched off. This entry was posted on December 13, 2013 by S4t4n in Tutorial and tagged Duty cycle, Frequency, Microcontroller, Pulse Width Modulation.